V-WHITE is a series of Akurat Lighting lights based on white LEDs, where chips emitting a monochromatic light of an approximately 405 nm wavelength (violet light) – instead of 450–460 nm (blue light) chips used in common white LEDs – act as emitters. 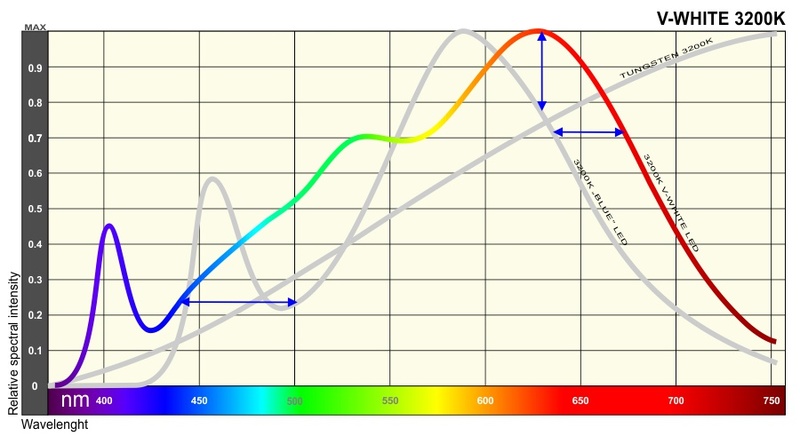 That shift significantly widened the spectrum of emitted white light, which in turn considerably enhanced rendering saturated blues and reds, as well as provided – in a wide range – a spectral distribution of light at 3200 K almost identical to that of natural incandescent lighting. The 5600 K diodes perform equally well. Lighting parameters of V-WHITE diodes are simply perfect. A CRI Ra value of as much as 98 is achieved. The CRI factors R1 through R14 are all equal to or greater than 95. R9, the most problematic one, exceeds 96, and R12 is nearly 99, while in our high-CRI lights, based on a blue chip, R9 reaches 82 – a level which still lies beyond the capabilities of most renowned equipment intended for the film and television business. We invite you to compare the results of tests performed on lighting units from various manufacturers. 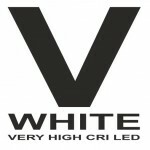 None of these would beat our V-WHITE in terms of light quality: similar CRI parameters are offered only by the so-called “remote phosphor” fixtures, and those fail to emit such a wide spectrum, especially within the range of blues, which results in an R12 factor lower than that of V-WHITE. Comparing the TLCI parameter (Television Lighting Consistency Index) of V-WHITE lights (98 for 3200 K and 99 for 5600 K) with that of competitors’ products is also interesting. For more information about the design of our white LED, the spectrum, the CRI and ways of determining as well as restrictions on applying thereof, see the Knowledge/Almost everything about CRI tab. The photometric data provided above is based on spectrometric tests performed on Akurat Lighting V-WHITE fixtures by the photometric laboratory Media Jet Sp. z o.o. i Wspólnicy Sp. k., ul. Suflerska 6, 04-471 Warszawa, tel. 22 213-03-00, lab@mediajet.pl.